Peak Performance - Team Building. This interactive presentation teaches how to �raise the bar� on performance by creating High Achieving Teams (H.A.T.�s). Based on research by Poser & Kouzes, it presents the common characteristics of H.A.T.�s across ALL fields of endeavor. Originally developed for dinner meetings, the activities work perfectly in conference or training rooms as well. Participants tackle challenges incorporating the lessons in pairs, table groups, small teams, and finally, the entire group together. The challenges keep participants active, while considering the space limitations of dining and conference room settings. Activities require good communications, problem solving, and working together, and attendees receive handouts to help them remember and implement the lessons. This program gives everyone a chance to help create an organizational masterpiece, and take home a reminder to anchor the experience for better retention. Small groups complete 4x8 foot �paint-by-number� panels, and then fit their panel in with many others to form a giant mural of the company�s products, headquarters, logos, a custom-design, or even a famous artist�s work. Since the concept is widely understood, there is little �prep� or �intro� time, and participants are actively engaged from the very beginning. The entire mural is displayed at an evening meal or another gathering time, to help participants better understand the relationship of individual, team, and company effort to achieve outstanding results. Participants take home a print of the finished work for their office. Participants in Peak Performance!��s Everyone�s a Star� experience teambuilding of epic proportions by creating their own film. During their program, the group produces a short finished movie. Maybe "Lord of the Rings� took longer, but it sure doesn�t have anything over these productions! Team members fill the roles of Director, Camera Person, Sound Engineer, Make-up Artist, Dialogue Coordinator, Continuity, Writer, and other critical positions. And with limited time, �on-camera� editing, and virtually no budget, the pressure is on. A promotional �ad� about the company�s product or service. Often, a dinner or evening activity following the program is a screening of the teams� productions. Participants receive a video incorporating all of the teams� videos, and a multi-media montage offering reminders of other major program components. Duration: 10-20 participants per hour per wall can have a high-quality experience that will leave them talking about the event for months! In this dramatic climax activity, participants use their bodies to form the client�s logo, slogan, meeting theme, or new product name (or some combination) in HUGE letters/symbols (and even in the correct font!) across the entire outdoor area. Peak Performance!� facilitators share the secrets of creating the largest version of the message in the shortest possible time frame and coach the participants to success. One side of the special card they receive helps them locate their part in the overall picture; the other side provides color for the logo, etc. (like the fan�s �card section� in college stadiums). Amazingly intricate patterns can be replicated with astonishing accuracy, even down to the font/typeface. Body Building creates an outstanding �Kodak moment,� which clients have used in promotions, annual reports, or advertising campaigns. Participants receive a photograph of the finished product afterward, which helps anchor the benefits from the program and provide additional value from the event. It�s fast, highly engaging, and produces a huge feeling of satisfaction for the climax of the event. In this second phase of information gathering, teams will be given a compass bearing (azimuth). In addition, the size and location of the search area will be provided. With this information, teams will search the area for clues. The teams will gain points for each clue found, plus they will gain valuable knowledge for future success. Using knowledge gained from a brief map and compass lesson, teams will navigate to the victim�s �point last seen� and follow clues from there to locate their missing person. �Response time� from rescue headquarters will be the scoring criteria. Teams will improvise a �rescue litter� using materials provided, and transport the �victim,� a container of water, through an obstacle course back to rescue headquarters. Scoring for this part of the exercise will be based on the amount of water remaining (not spilled) and the elapsed time, with penalties assigned for any unsafe actions. Each team will be interviewed by a �reporter� from the media, and asked the same series of questions. Responses will be videotaped and scored by the judges, and made available for viewing by the entire group at a subsequent session. Creative problem-solving techniques and effective team interactions. The Survivor Challenge! is framed as a journey for up to 20 tribes of as many as 20 participants. During each of the five legs of the journey, they will reach an activity station where they will be presented with a fun, colorful challenge that will require teamwork by the tribe to successfully accomplish. At each station, they�ll be introduced to a teamwork �building block� which will help them succeed at that challenge. Negotiate a maze to escape the island. Sailing effectively requires many of the same skills as business excellence: leadership, delegation, teamwork, communication, critical decision-making, and focus on the common goal. We can test your team, teach and practice vital skills, accomplish difficult tasks together, and build the basics of improved team performance while having a blast on the boat together. Sun, wind, spray, and beautiful views get us out of the �bored� room and our yacht �classroom� provides a dynamic, engaging, high-energy setting for optimum learning. 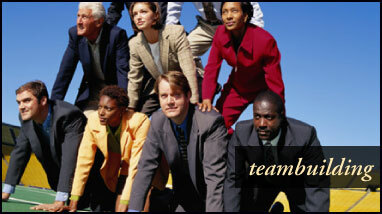 We�ve designed a number of team challenges that are proven team builders. Your group has to navigate to �waypoints,� collect and record data from them, and use the data to solve the �climax� challenge of the event. But, of course, first we have to learn how to sail! Each yacht is commanded by an experienced Coast Guard licensed captain (with required safety equipment). Peak Performance!� facilitators make it a fun, effective, and enduring learning experience. The vessels are fast, fun, and challenging. The entire program makes learning easy, lengthens retention, builds stronger teams, and produces returns to the company. The briefing starts over breakfast with a pre-sail discussion of how sailboats work, different crew positions, and an orientation to the team�s challenges and schedule. Sail new 30-40 foot sailboats through a challenging course as each person rotates through all the different positions on board. Some of the tasks at first appear impossible. With creative problem solving and good team communication skills, we�ll devise, execute, and evaluate our plan for success. Return to the clubhouse to discuss the lessons learned, identify actions plans for maximum ROI, and the follow-up system to achieve them. Celebrate your accomplishments with a high-energy closing session, receive award mementos, and have post-sail refreshments. You want memorable? You want a REAL challenge? You want to find out what your team�s made of? You want �em talking about it for months? Try the Corporate Challenge. Two non-stop days of challenges require the team to pool its knowledge, skill, and perseverance, just like your most difficult corporate challenges in real life. Teams that want to really push the limits can bivouac on the trail. Others can retire to the resort for evening recuperation between the two days. We provide the equipment, set the course, man the checkpoints, keep score, cheer you on, and make it an effective learning, as well as endurance event. You provide the enthusiasm, energy, and teamwork required to be successful. Each team is given a different blank crossword puzzle card. The goal is simple: to be the first team to successfully fill out the crossword puzzle card. Throughout the venue are 10 stations with eight coded envelopes. Each team has a different color. The envelopes will contain a question for that team�s crossword puzzle. For example: #4 down. What is the middle name of the bartender currently on duty in the lobby bar? Some of the questions may be answered by clues given out prior to the Scavenger Hunt day. Obstacles along the way are Peak Performance!� staff which team members must avoid on their way from station to station! If a Peak staff member tags any member of the teams, that team becomes wounded and must accomplish a brief penalty activity before that team can move on to the next station. Scavenger Hunt clues begin on Day 1 at the participants� check-in. All participants are given an envelope with a Scavenger Hunt introduction, plus their first clue (e.g., What is the bartender�s middle name?). Clues will randomly surface as the conference progresses. The clues participants receive will enable them to successfully complete their Scavenger Hunt crossword puzzle. What time was sunrise this morning? Name the third appetizer on the luncheon menu, etc. Prizes are awarded based on which team correctly filled out their crossword puzzles and the sequence of finish. You need strategy, planning, direction, clear vision of the goal, effective division of labor, specialized knowledge and skills, efficiency, and effectiveness to succeed in business. All of these are required in land navigation, too. Teams receive specialized maps, compasses, Global Positioning System (GPS) receivers, a specialized data collection system, and �marching orders.� They acquire points by visiting and collecting data from the largest possible number of points designated on the map and indicated by encrypted clues. More importantly, some points have equipment and resources the team will need to solve their �final exam� challenge at the end of the day. There�s too much to do and not enough time. Sound familiar? That�s why the skills learned in this exercise transfer so well to better productivity at work.